what were the teachings of the healing revival? Thousands were converted or healed through Branham’s ministry. He reported that throughout his life he was guided by an angel who regularly communicated with him. He operated in what appears to be a genuine gift of ‘the word of knowledge’ which was gave him the power to discern people's illnesses and thoughts. David Harrell reports of his popularity: "The power of a Branham service . . . remains a legend unparalleled in the history of the charismatic movement" (Harrell, p162). 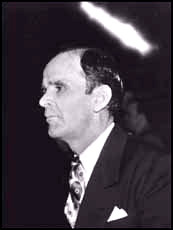 Branham's accuracy is attested by Walter J. Hollenweger, who interpreted for him in Zurich and ‘is not aware of any case in which he was mistaken in the often detailed statements he made’ (Hollenweger, The Pentecostals, p354). The colourful Canadian minister, song leader and teacher, W. J. Ern Baxter, who accompanied him 4-8 months every year from 1947-1953, said he never heard his discernment inaccurate even once. At the age of nineteen, in 1927, he travelled to Phoenix where he worked for several years on a ranch and became a professional boxer from 1928-1933, before returning home to his family after his brother Edward, died. He was a dependable youth always living a lived a clean, moral, quiet life. (Harrel, All Things are Possible, p28). He began to question if he were ready for eternity and started to search after God. He was assured of God’s reality but didn’t know how to pray, so he wrote on a piece of paper ‘God help me,’ and pinned it on a tree! Two years later while working for a gas company he was overcome with gas, became seriously ill and was hospitalised. The surgeons decided to remove his appendix and he requested a local anaesthetic and the presence of a Christian minister. During the operation he felt himself getting weaker and weaker, then he began to hear that familiar sound of wind rustling the leaves. This time the voice said, "I called you and you would not go." The words were repeated three times. Then he replied, "Lord, if that is you, let me go back again to earth and I will preach your Gospel from the housetops and street comers. I'll tell everyone about it!" 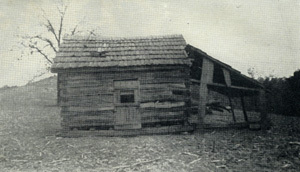 After the revival, his supporters built a small meeting house in Jeffersonville which came to be called Branham Tabernacle. It flourished for a few years despite economic depression, an unpaid position and Branham’s estrangement from other local Baptists due to the young minister's perceived mysticism. During these harsh years, Branham attended a "Jesus only" Pentecostal assembly and was invited to preach. Subsequently, he was invited to conduct revivals in several Pentecostal churches. But their dubious social reputation dissuaded him. He later believed this was a mistake. When the Ohio River flooded in 1937 he lost his beloved wife, Hope, to an illness and on the night of her funeral their second child of only nine months, Sharon Rose, died of a highly contagious spinal disease ((Pearry Green, ‘The Acts of the Prophet, p56-57). After that he worked at different lobs before becoming an Indiana game warden, the position he held when he received his famous angelic visit in 1946. Let’s listen to Branham tell his own story here. ‘I must tell you of the angel and the coming of the Gift. I shall never forget the time, May 7th 1946…. while walking around the house under a maple tree, it seemed that the whole top of the tree let loose. It seemed that something came down through that tree like a great rushing wind.... That afternoon I went away to a secret place to pray and read the Bible. I became deep in prayer; it seemed that my whole soul would tear from me. I cried before God. I laid my face to the ground. I looked up to God and cried, "If you will forgive me for the way that I have done, I'll try to do better. I'm sorry that I've been so neglectful all these years in doing the work you wanted me to do. Will you speak to me someway, God? If you don't help me, I can't go on. Branham returned to St. Louis ten months later to conduct a revival in Daugherty's church, from June 14 to June 25, 1946. As he preached and prayed for the sick astounding miracles occurred and his reputation rapidly spread throughout the Pentecostal culture. His next stop was the Bible Hour Tabernacle in Jonesboro, Arkansas, pastored by ‘Dad’ Humbard, the father of Rex Humbard. Gordon Lindsay later reported that ‘people gathered to the little city from twenty-eight states and Mexico, and some 25,000 people, it was estimated, attended the meeting…. It was said that for fifty miles there was no accommodation available.’ (Gordon Lindsay, A Man Sent from God, p93) Crutches were discarded, the blind saw and a woman was raised from the dead in an ambulance. Among those who attended the Branham revival in Arkansas were some of the members of a Pentecostal church in Shreveport, Louisiana, pastored by building contractor Jack Moore, who invited Branham to his church to minister. The meetings in Shreveport ware a spectacular success and Branham asked Jack Moore and Young Brown of Shreveport to accompany him and help to manage his meetings. Accompanied by Moore, Branham left Shreveport, and held revivals in San Antonio, Phoenix, and in several cities in California. 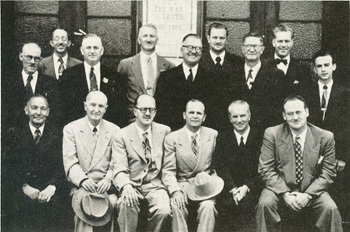 Moore persuaded his old friend, Gordon Lindsay, to visit Branham’s meetings in Sacramento and after the service Lindsay met with Branham and Moore. Lindsay was able to open doors in the Assemblies of God and the other major Pentecostal groups for Branham’s ministry. Branham lacked organisational skills and jumped at the opportunity to have Lindsay on his team. As the group moved to Vancouver, British Columbia, W. J. Em Baxter, a colourful Canadian minister, song-leader and teacher also joined Branham’s team. In the spring of 1948 they conducted a huge campaign in Kansas City and were visited by a young minister who had just launched a ministry of his own, Oral Roberts. Although Roberts was always a man who avoided modelling himself on others, allowing God to develop his own ministry, he was greatly moved by what he saw and heard, quickly adding healing to his evangelistic meetings. 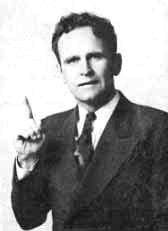 In the May 1948 the team were in Eugene, Oregon, when Branham announced that he was ill and unable to continue the ministry. This was not the best moment for Gordon Lindsay, Jack Moore, and Moore's daughter Anna Jeanne, as they had just a begun publication of a magazine called ‘The Voice of Healing,’ to promote the Branham meetings. Lindsay felt abandoned and he made a decision never again to exclusively promote Branham's work. Despite the rumour and disappointment of the masses, the long demanding nights of ministry to the sick had undoubtedly taken their toll. In his last meetings he was reported to have been staggering from exhaustion. The gruelling regime had left Branham a physically broken man after only a year. Nevertheless, in October of the same year, as suddenly as he had left from the field, Branham announced that he was returning to public ministry again. In late 1948 he made a successful tour which included meetings in California and at Alexander Dowie's old church in Zion, Illinois. In November 1949, he returned to Shreveport to visit Jack Moore and Gordon Lindsay who promptly and graciously arranged to accompany him again. 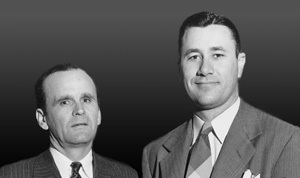 In January 1950, Moore, Lindsay, Ern Baxter, and F. F. Bosworth, joined Branham in Houston. The meetings grew, gathering as many as 8,000 people in a single service. It was here that the photograph of Rev. Branham with a supernatural halo of light above his head was taken. 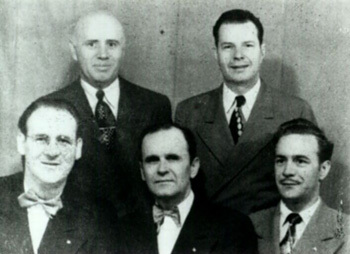 In April 1950, Branham, Moore, Lindsay, and Baxter made the first journey to Europe by a major American healing revivalist. They visited Finland, from where Donald Gee wrote, ‘Every service held in this hall witnessed a capacity crowd, while hundreds, and in some cases thousands, stood outside.’ (Donald Gee, Pentecost magazine, Sept. 1950, p8). Branham toured Norway and Sweden before returning home. Davjd du Plessis reported ‘I received a trans-ocean call from Brother Jacobs and my brother Justus du Plessis. They spoke from the Camp Grounds (Johannesburg) at 7 p.m. and told me that the police report over 3,000 cars parked for the Branham Meeting that evening, The Tabernacle has been enlarged to accommodate 10,000, but it still is too small. Mighty Miracles have been done already in the Name of Jesus and Johannesburg has never before been shaken so wonderfully……Letters that came this week tell of marvellous cases of healing. One woman got out of her wheelchair and pushed it away herself. Others were healed of cancer. A little boy with a paralysed leg was healed overnight and the leg lengthened four inches. Some cases have been declared perfectly healed after medical examinations.’ (David du Plessis, Pentecost magazine, Dec. 1951, p8). Julius Stadsklev reported on Branhams ministry in Durban, Sunday, Nov. 25, 1951:‘Before the afternoon service started, reports were coming in of those who had received their healing in the morning service. It would be impossible to relate the many cases of definite healings which took place in Durban that day. As Brother Branham saw visions of healings he pointed out the people and told them that they were healed. There were those who stepped out of their wheelchairs and walked, some for the first time in many years. There was the deaf and dumb who smiled and made vocal sounds as they were able to hear for the first time in their lives. There were the little children who could not understand it all but who were now able to walk as they had never been able to before. 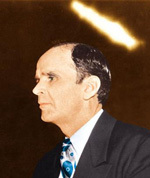 When the gift is operating, Brother Branham is the most sensitive person to the Presence and working of the Holy Spirit and to spiritual realities of any person I have ever known. Under the anointing, which operates his spiritual gifts, and when he is conscious of the Angel's presence, he seems to break through the veil of the flesh into the world of Spirit, to be struck through and through with a sense of the unseen’. Such results accompanied him wherever he conducted campaigns. In one 1950 meeting, "nine deaf mutes came in the prayer line, and all nine were healed" (Bosworth, Voice of Healing, January, 1950, p. 5). Branham’s shelf-life began to wane as other popular healing ministries emerged. Oral Roberts was able to adapt his ministry to the more cultured Pentecostals and a new breed of charismatics who had arisen. The immense stage presence and outrageous faith of Jack Coe secured a massive following and he was able to fill the largest revival tent in the world (220 feet by 440 feet seating over 22,000 people) The flamboyance and holy boldness of A. A. Allen drew multitudes to his meetings which outlived most healing evangelists' ministries. T. L. Osborn took the healing and deliverance message to the mission field with amazing results. Tommy Hicks went to Argentina in 1954 with reportedly as many as four hundred thousand persons attending a single service. Some 50-60 other ministries followed their examples, though in a considerably smaller way. By 1955 Branham began to encounter finances difficulties, doctrinal divergence and ostracism by major Pentecostal churches and his meetings became less and less influential. On December 18, 1965, driving to Arizona, he was hit head-on by a drunken driver, and he died on Christmas Eve. Some of his difficulties could have been avoided, some were the inevitable results of such a dramatic and spectacular ministries which undergo a glowing, meteoric rise to international fame before they burn up on their return to normality. Such is the nature of revivals. They can never be sustained as the norm, nor were they designed to. Nevertheless the legacy left behind by William Marriott Branham is phenomenal. He had a profound influence on the Pentecostalism of his day, spurring the movement on to expect more activity of the Holy Spirit and His gifts in its ministry. 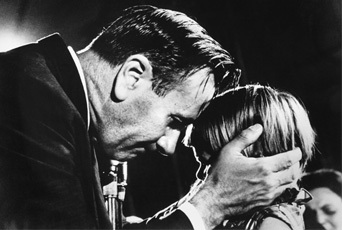 The Charismatic Movement traces its origins back through the Full Gospel Businessmen’s Association and Oral Roberts, with scores of others connected with the healing movement. Branham’s ministry was the major spur to thousands of Spirit-filled evangelists, not just in America, but across the world. 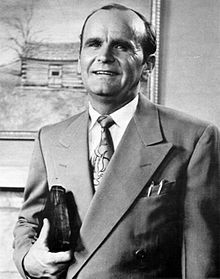 There may have been many things that were questionable about this ministry, especially in the later years, but the extraordinary results across the world far outweigh these and clearly verify William Branham’s ministry as a gift from God. May God give us all grace to deal with what we don’t agree with and wisdom to imitate what we see of God’s blessing!